DIY painting doesn’t have to always end up with crooked lines, and paint speckles everywhere. Using these easy painting hacks will help make the painting process faster and less messy. By hanging the brushes or laying them flat, it helps prevent the bristles from bending and it retains their usefulness for your next painting adventure. There is also no need to rise your paint brushes before using them the next time, because the softener will help distribute the paint more smoothly. When painting around large objects or just in general it can be tough to keep things clean from paint speckles. If you surround the object or area with a plastic wrap you can keep drips from destroying that lovely finish on your flooring or trim. For an extra tight wrap, it is highly recommended that you use a wrap with an adhesive backing which will help the wrap stick to the surface and prevent the paint splatters. Once you’ve finished the job, it is easy, just unwrap for a paint-free finish. Your local hardwood store should carry special painter’s plastic wrap with this adhesive backing on it. 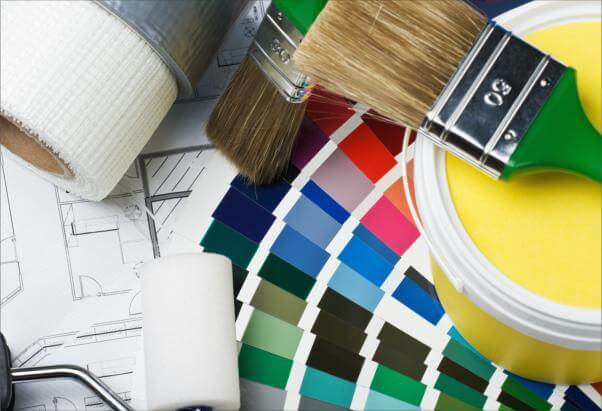 The smell of paint can be an intense odor and it can get old very quickly. To reduce the paint odor there are a few different things you can add to your paint before you apply it. Overpower the paint smell with a little bit of vanilla or lemon extract. There are products specifically made for paint that smell like vanilla, but you can get the same effect with what’s in your kitchen. For darker paints, add a couple of drops of vanilla extract, artificial is fine, per gallon of paint to reduce the strong smell and keep your room smelling sweet for weeks to come. For light colored paints you will want to use lemon extract instead, so the vanilla tint doesn’t ruin your paint color. Painting’s a messy job but using roll after roll of paper towels is neither efficient nor environmentally-friendly. Why not repurpose those old t-shirts and rags you have laying around your house and reduce waste? Always have a rag in your pocket so you, the brush or roller, and your home can stay clean. Oh darn, a drop of Fire Engine Red just splashed on your white window frame! When it comes to paint you only have a few minutes to wipe it up before the paint dries. Keep Q-tips handy for these types of mistakes. Stash some in your pocket and you will be thankful when an emergency like this arises. You can also use these Q-tips to touch up imperfections on newly-painted walls without having to dirty your entire paintbrush. Sometimes while painting there are things you don’t want painted, like screws and hinges. A neat little hack that will help keep those little spots clean is by applying petroleum jelly to those areas. Using those trusty Q-tips, go over all the bits and pieces that you don’t want painted, like those screws and hinges. With the jelly applied, even accidental slips won’t leave you heartbroken. Not only can this help small spots, but it can help prevent doors and windows from sticking. Just run the jelly along the seals on the doors and windows and they won’t get sealed shut. Painters tape is supposed to make your paint job easy and stress-free. But when strips of perfect paint peel off along with the adhesive-or you just can’t get the darn tape to come off at all-you might want to try this hack. To help stubborn painters’ tape, turn your hair dryer on low heat toward your handiwork. Holding the hair dryer about three inches from the wall will help the adhesive soften and ensure an even line, making removal stress-free, and ensuring you keep that dreamy, crisp paint line.